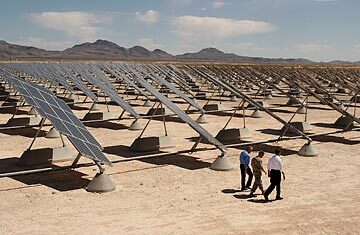 New juice Obama, right, tours a huge solar array in Nevada. Catching rays is easy; storing and shipping solar energy is harder. TIME Polls America: Spend or Cut? The American Recovery and Reinvestment Act of 2009  President Obama's $787 billion stimulus  has been marketed as a jobs bill, and that's how it's been judged. The White House says it has saved or created about 3 million jobs, helping avoid a depression and end a recession. Republicans mock it as a Big Government boondoggle that has failed to prevent rampant unemployment despite a massive expansion of the deficit. Liberals complain that it wasn't massive enough. It's an interesting debate. Politically, it's awkward to argue that things would have been even worse without the stimulus, even though that's what most nonpartisan economists believe. But the battle over the Recovery Act's short-term rescue has obscured its more enduring mission: a long-term push to change the country. It was about jobs, sure, but also about fighting oil addiction and global warming, transforming health care and education, and building a competitive 21st century economy. Some Republicans have called it an under-the-radar scramble to advance Obama's agenda  and they've got a point. Yes, the stimulus has cut taxes for 95% of working Americans, bailed out every state, hustled record amounts of unemployment benefits and other aid to struggling families and funded more than 100,000 projects to upgrade roads, subways, schools, airports, military bases and much more. But in the words of Vice President Joe Biden, Obama's effusive Recovery Act point man, "Now the fun stuff starts!" The "fun stuff," about one-sixth of the total cost, is an all-out effort to exploit the crisis to make green energy, green building and green transportation real; launch green manufacturing industries; computerize a pen-and-paper health system; promote data-driven school reforms; and ramp up the research of the future. "This is a chance to do something big, man!" Biden said during a 90-minute interview with TIME. For starters, the Recovery Act is the most ambitious energy legislation in history, converting the Energy Department into the world's largest venture-capital fund. It's pouring $90 billion into clean energy, including unprecedented investments in a smart grid; energy efficiency; electric cars; renewable power from the sun, wind and earth; cleaner coal; advanced biofuels; and factories to manufacture green stuff in the U.S. The act will also triple the number of smart electric meters in our homes, quadruple the number of hybrids in the federal auto fleet and finance far-out energy research through a new government incubator modeled after the Pentagon agency that fathered the Internet. The only stimulus energy program that's gotten much attention so far  chiefly because it got off to a slow start  is a $5 billion effort to weatherize homes. But the Recovery Act's line items represent the first steps to a low-carbon economy. "It will leverage a very different energy future," says Kristin Mayes, the Republican chair of Arizona's utility commission. "It really moves us toward a tipping point." The stimulus is also stocked with nonenergy game changers, like a tenfold increase in funding to expand access to broadband and an effort to sequence more than 2,300 complete human genomes  when only 34 were sequenced with all previous aid. There's $8 billion for a high-speed passenger rail network, the boldest federal transportation initiative since the interstate highways. There's $4.35 billion in Race to the Top grants to promote accountability in public schools, perhaps the most significant federal education initiative ever  it's already prompted 35 states and the District of Columbia to adopt reforms to qualify for the cash. There's $20 billion to move health records into the digital age, which should reduce redundant tests, dangerous drug interactions and errors caused by doctors with chicken-scratch handwriting. Health and Human Services Secretary Kathleen Sebelius calls that initiative the foundation for Obama's health care reform and "maybe the single biggest component in improving quality and lowering costs." Any of those programs would have been a revolution in its own right. "We've seen more reform in the last year than we've seen in decades, and we haven't spent a dime yet," says Education Secretary Arne Duncan. "It's staggering how the Recovery Act is driving change." That was the point. Critics have complained that while the New Deal left behind iconic monuments  courthouses, parks, the Lincoln Tunnel, the Grand Coulee Dam  this New New Deal will leave a mundane legacy of sewage plants, repaved roads, bus repairs and caulked windows. In fact, it will create new icons too: solar arrays, zero-energy border stations, an eco-friendly Coast Guard headquarters, an "advanced synchrotron light source" in a New York lab. But its main legacy will be change. The stimulus passed just a month after Obama's inauguration, but it may be his signature effort to reshape America  as well as its government. "Let's Just Go Build It!" After Obama's election, Depression scholar Christina Romer delivered a freak-out briefing to his transition team, warning that to avoid a 1930s-style collapse, Washington needed to pump at least $800 billion into the frozen economy  and fast. "We were in a tailspin," recalls Romer, who is about to step down as chair of Obama's Council of Economic Advisers. "I was completely sympathetic to the idea that we shouldn't just dig ditches and fill them in. But saving the economy had to be paramount." Obama's economists argued for tax cuts and income transfers to get cash circulating quickly, emergency aid to states to prevent layoffs of cops and teachers and off-the-shelf highway projects to put people to work. They wanted a textbook Keynesian response to an economy in cardiac arrest: adding money to existing programs via existing formulas or handing it to governors, seniors and first-time home buyers. They weren't keen to reinvent the wheel. But Obama and Biden also saw a golden opportunity to address priorities; they emphasized shovel-worthy as well as shovel-ready. Biden recalls brainstorming with Obama about an all-in push for a smarter electrical grid that would reduce blackouts, promote renewables and give families more control over their energy diet: "We said, 'God, wouldn't it be wonderful? Why don't we invest $100 billion? Let's just go build it!' "